While the Wagner 0518050 Control Spray Double Duty Paint Sprayer may not be for everyone, it is a great low-cost option when you have a small project to complete. It’s biggest selling features are the quick setup, various adjustments, and quick cleanup. Save yourself time and money by trying this HVLP paint sprayer for your next project. The Wagner 0518050 Control Spray Double Duty Paint Sprayer is a must have when you are on a tight budget but still want the flexibility of having a paint sprayer. The unit features replaceable filters to help keep particles out of the paint and avoid clogs. It also has a 1-quart cup for the smaller, interior work and a 1 ½-quart cup for larger projects. By using air pressure technology and AC power, you can achieve a continuous spray. It also offers a spark arrested dual-stage motor to prevent the ignition of flammable fumes. Another great aspect of the Wagner Control Spray Double Duty Paint Sprayer is that it sets up in just 5 minutes and cleans up in about 10. This makes it a valuable tool even when you just have a small project to complete. At only 4.2 pounds, this unit is lightweight and easy to carry wherever you need to. It won’t make your hands or wrist tired while using it, meaning you can paint more. Many of the users have felt that this is a fantastic budget-friendly model that far exceeded expectations based on the price. The Lock-n-Go Technology offers for quick material change with this unit. It also makes it easy to setup or cleanup. You can feel secure with this purchase as the manufacturer backs it up with a 1-year warranty. Designed for both indoor and outdoor use, you can spray a multitude of materials with it. Easily spray your stains, sealers and other light bodied materials with the maximum control and lower overspray. Users have found it to be helpful with staining a deck or refinishing cabinets. It is also a great tool if you have some minor detail work to accomplish. You could use this instead of pulling out your larger paint sprayer, but still, save time versus using the roller and brushes. Ideally, you will want to use this only if your project will be using thinner substances and it isn’t a large surface. Another good way to use this Wagner paint sprayer is for staining furniture, decks and trim. It is best if you aren’t a new user to paint sprayers when purchasing this model. Consider its bigger brother the Control Spray Max for a bit of extra power and versatility. While you would be able to figure it out with some practice, it can be tricky knowing how to properly thin the materials for spraying. The setup of the Wagner 0518050 Control Spray is easy and shouldn’t take more than 5 minutes. First, align the arrow with the “unlock” symbol. Then, twist to lock your handle in place. Align your suction tube properly, facing towards the front of the gun for when you are spraying down and facing towards the back when spraying up. Prepare your materials properly and then fill the container. When you are ready to spray, make all the necessary adjustments. Then, simply plug in and practice spraying. Even if you are experienced with paint sprayers, you will want to practice on a piece of scrap first so you can get used to the feel of the machine. This is also a good time to try out all the adjustments and see what will work best for you. 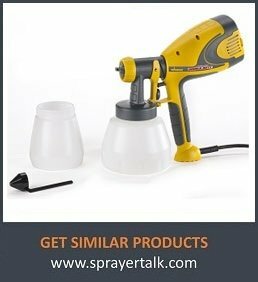 The Wagner Control Spray Double Duty Paint Sprayer is an HVLP sprayer which stands for high-volume, low-pressure. The 2-stage air turbine will provide you with up to 4.9 fluid-ounces of material spray per minute. While this isn’t as much as some machines, it is more than you will accomplish with your paint roller and brush. There are many controls that will help you to achieve the best paint job possible. The spray pattern can easily be adjusted by turning the ears of the air cap to a vertical fan, horizontal fan or round. You can also turn the regulator on the trigger of the spray gun to achieve various adjustments for material flow. Choose from ½-inch wide to 10-inch wide patterns and anything between. Thanks to the Lock-n-Go technology, the cleanup is painless and simple to accomplish. Always make sure that your spray gun is unplugged before you begin the cleaning process. Then, unscrew your container and empty all the contents back into the original can. Rinse out the cup and then fill it with an appropriate solution. If you used latex materials, you’ll want warm soapy water and if you used oil-based materials, be sure to use mineral spirits. Attach the cup back up to the gun and plug it in. Spray the solution through the gun for several seconds. Be sure you do this in a safe space like a bucket. Unplug the gun again and pull the trigger to release the materials back into the cup. Wipe the exterior of the gun and parts clean. Now, you want to gently clean the cup, container seal, suction tube, air cap, and the nozzle with an appropriate cleaning brush and solution. Use a thin layer of petroleum jelly to lubricate the O-ring. That’s it! The Wagner Control Spray is one of the cheapest options on the market and perfect for the simple paint spraying tasks. It’s easy to setup, simple to use, and cleaning is a breeze. All these combined make it an excellent sprayer at the low price end of the market.